The heat utilization concept of Mr. Pfaffenbach serves as a flagship project for the whole industry. The Rigo Biogas GmbH with headquarters in Morschen, Hessen, operates since 2010 a biogas plant based on renewable raw materials and agricultural fertilizers. 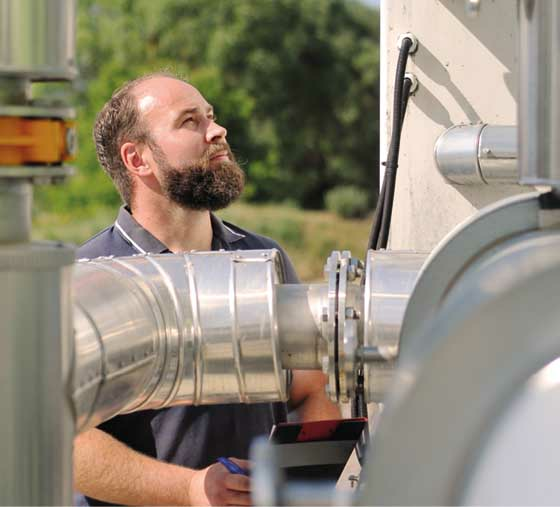 “After the first experiences with our 250 kilowatt system, it quickly became clear that the economic efficiency of the biogas plant is not secured without a heat concept therefore the plant was continuously expanded from 2011”, explains the owner Ottmar Pfaffenbach. Today at 1,400 meters from the plant there are satellite sites for two further cogeneration units and a very effective heat- and refrigeration concept is in operation directly next to a monastery and a affiliated conference hotel. “In order to optimize the degree of utilization of waste heat, we have a sorption refrigeration plant with a nominal capacity of 105 kilowatts installed. From the waste heat from the combined heat and power plant cold with approx. 6 degrees Celsius is produced, which is used in the monastery hotel for air conditioning. 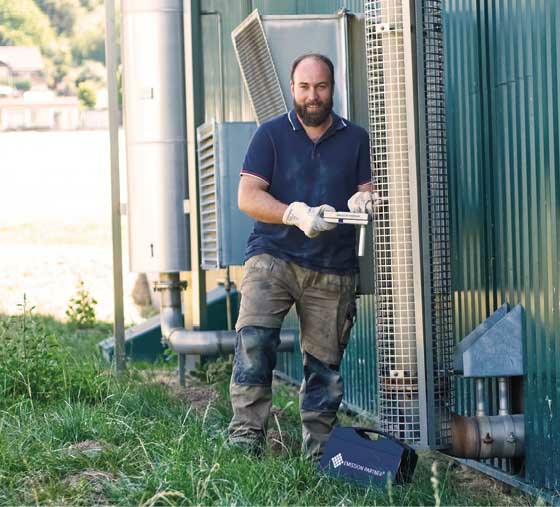 The average heat extraction at the monastery site is at 97 percent and thus we actively contribute as a biogas plant to an improved environment,” reports Pfaffenbach. 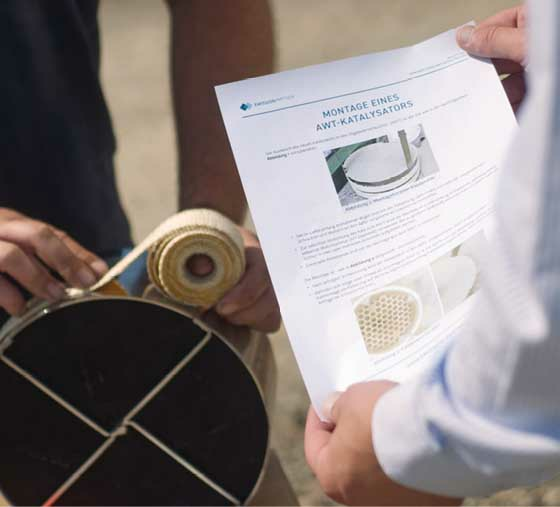 Tighter requirements apply in the federal state of Hessen to installed catalytic converters: an accredited and for the authority permissible emission measurement can be executed only three months after installation of a new catalytic converter. This is to ensure that the emission limit values are not only met during measurement, but also comply permanently. For self-monitoring, Mr. Pfaffenbach therefore also uses the formaldehyde rapid tester from Emission Partner for monthly voluntary measurement of its catalysts. “The measurement takes only 15 minutes and the handling of the device is very simple. The formaldehyde values of my catalytic converters installed in January 2018 were at the last measurement in August 2018 still below 10 mg/Nm³,” says Pfaffenbach. 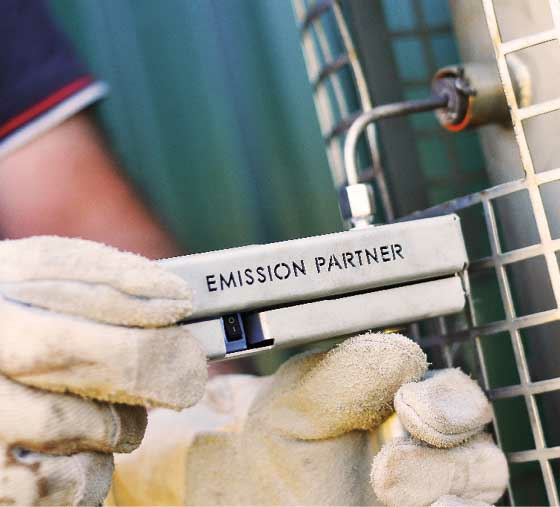 “Thanks to the wide range of products from Emission Partner I was able to reduce the number of different suppliers and reduce the associated costs, therefore I have more time for my agricultural operation”, describes Pfaffenbach.